The afternoon visit to shopping areas including Portobello Market, and Piccadilly Circus. Sep 1 - Westminster Abbey in the morning. Head for the South Bank for a trip on the London Eye. Sep 2 - Trip to the British Library in the morning, where there is a room full of literary treasures on display - is there a tea here? For more shopping, go to Oxford Street. Aug 29 as we land the same day, will be able to do sightseeing of all those key places in about half a day or should I give it 1 more day? Will I be able to see change of Guards in Windsor castle( Aug 30) if we take a bus at 10 AM from near our hotel? Should I buy a London pass or London for 2 . I have not bought any tickets yet except flight going to London and hotel reservation. Are there any events during this time which I am missing? You get off the plane most likely jet lagged and immediately the next day leave London of a loooooooong coach tour. Bad idea IMO. 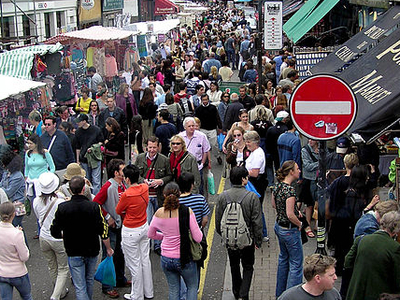 Portobello Rd Market is on Saturdays and you are planning it for Sunday. And I wouldn't plan a shopping trip focused on Picadilly Circus. The British Library is quite near the British Museum - I'd maybe combine them on the same day. More later . . . and Do NOT but the London Pass! You seem to have a mania for the bridges in London. Frankly - they are bridges - nothing special. I can;t imagine going out of my way to see any of them (not like Pont Neuf in Paris). If you walk over one to get somewhere fine - but they really aren't "sights". As for shopping. What do you want to buy - or are you just browsing. Prices in UK are likely to be much higher than in the US for the same thing (if that's where you are from). So if you tell us what you want and what price range (budget, moderate, luxury) people can reco areas and stores. I love to visit Harrod's - not to buy anything except pasties or chocs in the food court - but just to see some of the luxury goods and interesting departments. Also nice place to have an afternoon tea. But you don;t shop in Picadilly Circus - except for post cards. janisj is right on, as usual. Why not substitute your Sept. 4 itinerary for your day of arrival: check into hotel, freshen up, have lunch, then walk around Hyde Park and take a look at the Palace. You can't get into Buckingham Palace, but there is a small art museum you can see. Aug. 30: that is going to be a very long day trip. Have you booked this yet? I'd think about Windsor Castle with a trip to Hampton Court Palace instead. With seven days, you probably have time for another day trip in which you can do Stonehenge, Avebury (a better site IMO) and possibly Bath. Combine British Museum and British Library in one day to make the time. On September 1, you can walk around near the Houses of Parliament while you're at Westminster Abbey. No London Pass because most things in London are free. Do get Oyster cards when you get there for your transportation needs. No Hop on Hop Off bus needed, either. When should I see changing of guards? does anyone know when is the ceremony happening in September? Where should I see it from - Buckingham Palace or Windsor Castle? Although this only lists August, in September it is on the even days. Final choice may come down to which date you do either Windsor or Buckingham Palace and what time you are likely to be at either place. Do not buy the London pass. Do not do the hop on hop off, there are various bus lines that will take you to see what you want like the # 9, 15, 136. They get just as caught up in traffic as the HOHO buses, but don't cost $35 per person. (1) Go to www.daysoutguide.co.uk. Print every voucher offer that looks interesting. There is no limit. (2) Bring passport size headshots of you and the other half of "we" with you to London. (3) Purchase 7-day paper travelcard for each person (zones 1-2 only) at nearest NATIONAL RAIL station (Victoria, Charing X, St Pancras, etc) ticket booth. You will get a flimsy orange-ish paper card. Use that on the Tube and buses. (4) Present appropriate voucher with you and travelcard at site covered by voucher program (e.g., Tower, Churchill War Rooms, etc). Check Londontown.com and timeout.com for events. Leave your Eye times open - London weather changes frequently. The Eye won't be fun in a rainstorm. London is super expensive so consider spending some days elsewhere, say on the sea. Also I qualified for the 2-4-1 offers because I took rail to / from London from Gatwick (most land at Heathrow and tube it in and that doesn't work) but ended up not using any coupons. The only major attractions are the war rooms (still very pricy even at 2-4-1) and the the Tower but that offer is suspended mid-July to early sept. Many London admissions are in the $30 US range but with half of Italy and a quarter of China vacationing there at any given time they can get away with it. Well, there's a nice stereotyping. London is not super expensive - the museums are almost all free and there are lots of inexpensive places to eat. I hate that stereotype. Yes you can! It is open to the public in August and September. VERY HIGHLY Recommended. Please ignore suggestions to leave London - you have a very short visit. If you had 10 days.2 weeks then sure spend a few days out in the countryside. London does not need to be expensive - there are LOTS of ways to save a bit of ££. Agree that London is not necessarily expensive. Many museums are free. Restaurants often have great deals, menus for around 10 pounds, tube and bus are not expensive. I often buy things in London much more cheaply than in Belgium, where I live. That includes many cosmetics. 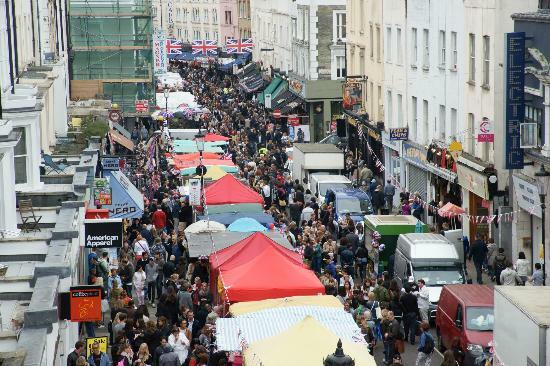 Portobello Road on a Saturday: go early and leave by 11 am. Friday morning is better. The poppies at the Tower look amazing, go early so you can take photos before the crowds arrive. >Sep 2 - Trip to the British Library in the morning, where there is a room full of literary >treasures on display - is there a tea here? There is a cafeteria - not a picturesque tea room - at the British Library. Prices are quite reasonable for London, food is good cafeteria standard. I think outside there is or used to be a tea cart. I made some changes as per the advice. Aug 30 - A morning tour of the Tower of London , The afternoon visit to shopping areas including Portobello Market, and Harrods. Walk along the South Bank Walk, heading towards Shakespeare's Globe Theatre. Please let me know if this looks doable. Thanks! You have to decide how important Portobello Road is to you. It is not a good Saturday afternoon activity. The way to see/shop at Portobello Road is to get there VERY early in the AM (Unfortunately this will be you first full day in London and early may not be easy.) - like 8:00 or 8:30 and be out of there by 10:00AM. After about 9:30 it just becomes unbelievably crowded - too crowded to see anything really and way too crowded to walk comfortably. This may give you an idea. Both of these were taken fairly early in the day before it got REALLY crowded. If you can't get there early - I personally won't go at all. I would ditch both the zoo and aquarium. And I enjoy zoos/aquaria. The London zoo is OK but not really world class and takes a lot of time. The aquarium is definitely meh . . . IF you've been to any other good aquariums. Thanks jainsj, I will skip Portobello Market, Zoo/ aquarium. What else can you suggest me for Saturday afternoon / evening? Any suggestions for nightlife? Clubs? Are you interested in theatre? Scores of plays/musicals running in the West End and elsewhere. I would not do Harrods on Saturday. It gets crowded every day - but on Saturdays it can get so over-crowded that TFL actually closes (temporarily) the exit from the tube station. I might pick one of your weekday mornings to hit Harrods. I see your plans are light on museums or galleries -- I would ditch Mme Tussauds and add something better like the Victoria & Albert or National Gallery or Imperial War Museum (just re-opened after major refurbishing and the WWII Centenary). I would also ditch the dinner cruise. Most are over priced and the food is underwhelming. I'd take a daytime boat trip instead and then have a very nice dinner (on land). will cost less by far, you'll see more and eat better. After visiting the Tower of London you could take a boat from Tower Pier to Westminster Pier. We are not into theaters. Can you recommend any places to spend Saturday evening / night?